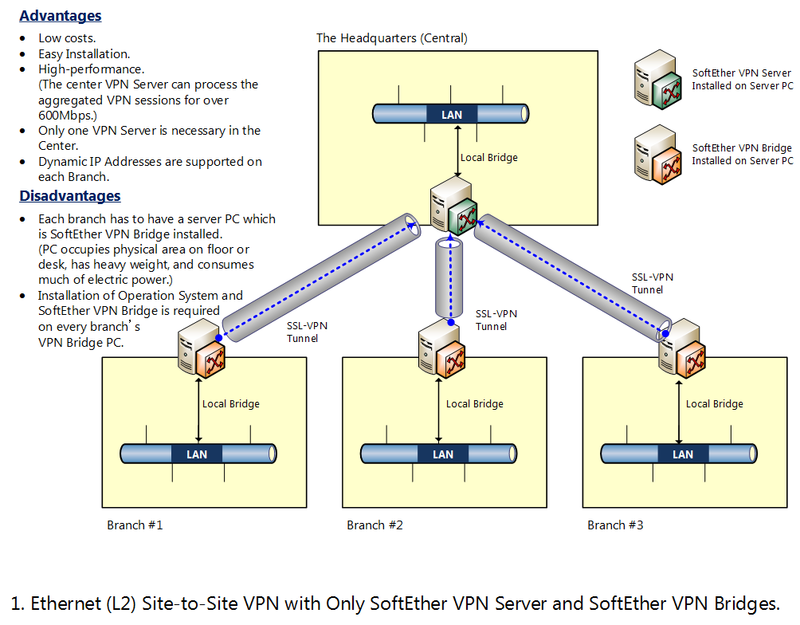 Why Cisco Routers with SoftEther VPN Server is the Best Solution? This document explains the advantage of using the combination of both Cisco Routers and SoftEther VPN Server, and using the L2TPv3/IPsec VPN Protocol to make site-to-site Ethernet Bridging VPNs between serveral sites. 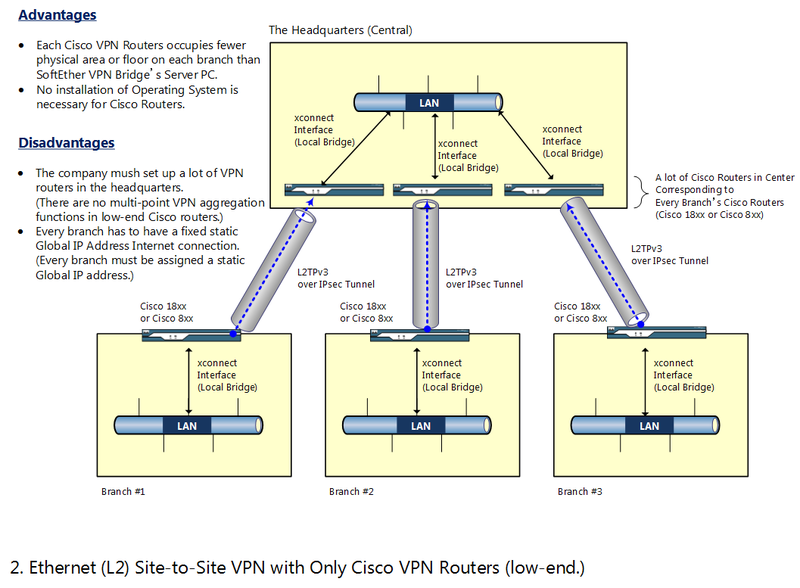 Cisco's low-end VPN Routers can have only point-to-point L2TPv3 VPN tunnels. If you have three branches, then you have to have three VPN routers in the center in order to correspond each branches. The center VPN routers must know the fixed static global IP address of each branch Cisco routers. 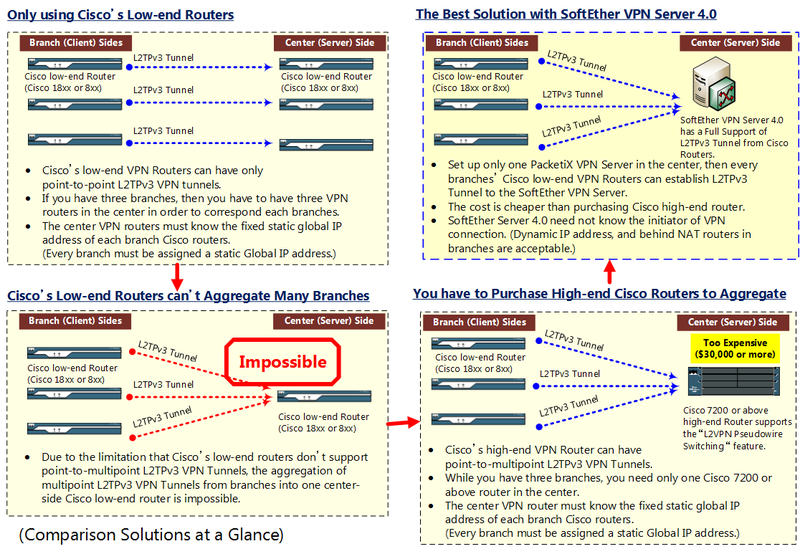 Due to the limitation that Cisco's low-end routers don't support point-to-multipoint L2TPv3 VPN Tunnels, the aggregation of multipoint L2TPv3 VPN Tunnels from branches into one center-side Cisco low-end router is impossible. 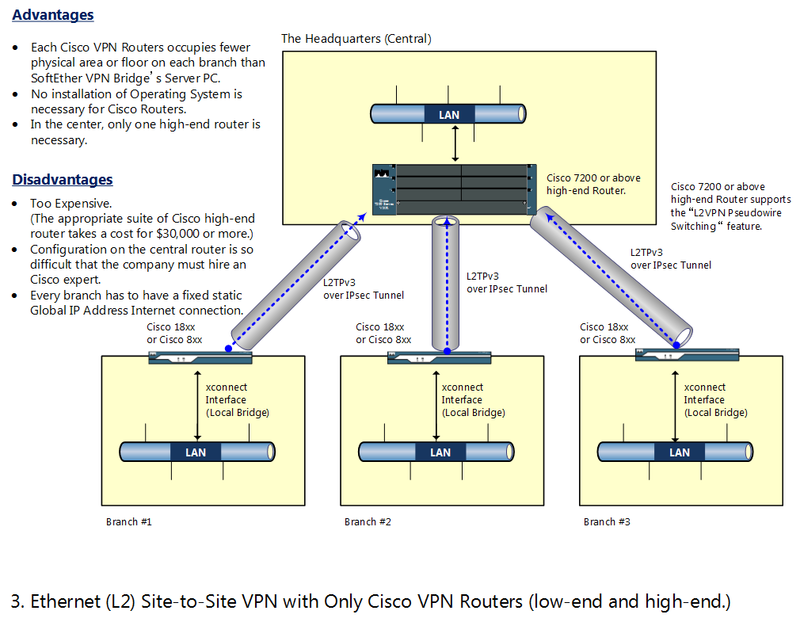 Cisco's high-end VPN Router can have point-to-multipoint L2TPv3 VPN Tunnels. While you have three branches, you need only one Cisco 7200 or above router in the center. The center VPN router must know the fixed static global IP address of each branch Cisco routers. (Every branch must be assigned a static Global IP addres. Set up only one SoftEther VPN Server in the center, then every branches' Cisco low-end VPN Routers can establish L2TPv3 Tunnel to the SoftEther VPN Server. The cost is cheaper than purchasing Cisco high-end router. Only one VPN Server is necessary in the Center. Dynamic IP Addresses are supported on each Branch. Each branch has to have a server PC which is SoftEther VPN Bridge installed. Installation of Operation System and SoftEther VPN Bridge is required on every branch's VPN Bridge PC. 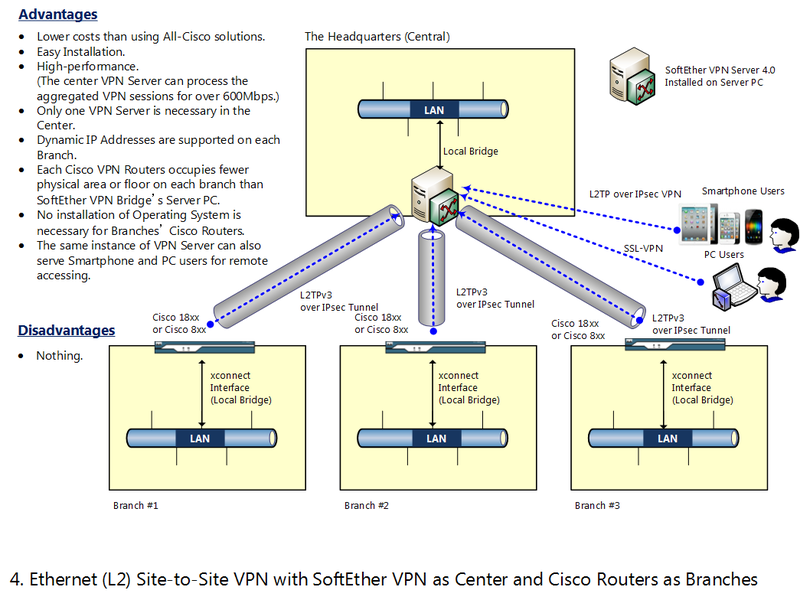 Each Cisco VPN Routers occupies fewer physical area or floor on each branch than SoftEther VPN Bridge's Server PC. No installation of Operating System is necessary for Cisco Routers. The company mush set up a lot of VPN routers in the headquarters. Every branch has to have a fixed static Global IP Address Internet connection. In the center, only one high-end router is necessary. Configuration on the central router is too difficult. The company must hire a Cisco expert. No installation of Operating System is necessary for Branches' Cisco Routers. The same instance of VPN Server can also serve Smartphone and PC users for remote accessing.